The survey found that 35 percent overall say they would likely choose the independent; 25 percent of Republicans, 49 percent of independents and 30 percent of Democrats agree. This could worry the GOP and the Democrats, concerned the trend would split the vote in a close election. Another 46 percent, however, say it’s not likely they would vote for the independent; 59 percent of Republicans, 25 percent of independents and 53 percent of Democrats agree. The poll revealed dismal approval ratings for the two main parties. It found that only 22 percent of voters overall say the Republican and Democratic parties to an “adequate job” of representing the American people; 26 percent of Republicans, 9 percent of independents and 31 percent of Democrats agree. The Politico/Morning Consult poll of 1,993 registered U.S. voters was conducted Feb. 1-2. Meanwhile, the national Libertarian Party staged its own State of the Union event Tuesday, delivered online by Jeff Hewitt, a Libertarian elected to the Riverside County, California, board of supervisors in November. One must ask themselves, What good are the current political Parties doing for our country?? President Donald Trump is working for the good of the country, but just exactly what did the Republican Party do for our country when they controlled all three branches of government? Just look at the destruction and immorality that the Democrats created when they had control of all three branches of government. The Democrats in control of the State of New York, pass laws that a mother can legally kill her baby during birth! Is this in anyway good for the country or humanity? We don’t need life time self-serving, self-righteous professional politicians. We need to limit ALL politicians to two terms! And two terms only! No matter what political position they are going for! Like everything else Trump favors that would help the people- and not self-serving politicians, he supports term limits. To add to your post I think there needs to be an age limit for judges. We don’t need senile, doddering justices who fall asleep in court unable to hear the arguments. I would say serve until you’re 75 and then retire. Are you referring to Ruth Bader Ginsberg( lol ) indirectly, the younger supreme Court justices, as well, seem to be sleeping or ( Bias ) in their decisions, which they hand down. Term limits is the answer on all political positions, Supreme Court Justices as well.. The solution is to make judges subject to periodic re-election. No judge should have a life-long term of office. Unlimited terms leads to unlimited irresponsibility and unlimited corruption. If a judge is doing a good job, fine. But if not, send them back to private law practice or retirement. That’s something i wonder. WE see age limits for many other jobs.. Whether driver, pilot, cop, military, teacher and the like. SO WHY NOT JUDGES and politicians! Roger that! What does it say about us when any American mother or mother-to-be would willingly support a policy of that nature? The subject of childbirth should not even be a political issue or at the least discussed by an all female legislative committee since as men we have only shown an innate ability to take life and therefore disqualifies us from any participation in the discussions and present only as observers. Lloyd M.
The Democrat party is on the road to self destruction, with the platform of Baby killing, Open borders, Higher taxes to all but them and socilisams. The Independent party will replace them soon, So Let’s have a run off between the highest two candidates that get the most votes between the Democrats and the future independents wanna be’s and let the winner run against the Republicans. America will win. People keep saying they are on the road to self destruction. I AM TIRED OF WAITING! I agree, because they are creating a LOT of “collateral damage” among the REST of us in the hysterical death throes of their self-destruction! Where is the law designating two parties as the legal number? When did the “two-party system” become “settled law”? What about Whigs, Wobblies, The American Communist party, Peace And Freedom Party, The Buffalo party, etc.? Not advocating one way or the other I just don’t recall any legal precedent for a limit on the number of views allowed to compete in an election. Other parties are on the ballot, but I am not so sure I would describe them as competitive. Have you voted lately? There is no limit to two parties. But California is an exception with its “jungle primary” that went into effect in 2016 (I think). I live in Cal. For the last two general elections, there were only two US senate candidates and both were Dem. There were a few other offices for which there were only two candidates and both were Dem. So no Republican even ran? How is that party serving/advancing your interests, or the national party’s then? How are you being represented in your state? What do you have to lose by voting for a third party conservative if you have no Republican in the contest? Again, I’m not advocating, just asking. That didn’t use to be a bad thing. I moved from a county where my vote will never be counted. In 2010, the state passed a new law requiring candidates to participate in a single consolidated open primary, often called the “jungle primary.” In these primaries, the top two vote-getters end up on the election ballot, where they square off against each other. This system has driven many Republicans off the election ballot, as the top two slots are often won by Democrats. There isn’t one Max. Just the way things have been for far too long. Joe lieberman iirc was the last “REAL” Independent. It’s not a law, Max daddy. It happened out of practicality. Once it got to the point where you could only win if you were a member of one of these Parties, it became a thing. Other countries use a different flavor of the Parliamentary System. They might have 6-7 Parties going on and can only get stuff passed by forming coalitions. This might work in Congress but it wouldn’t work in the White House. In Britain for instance, the Prime Minister is still a member of the House of Commons (their Congress). They don’t have a separate branch for the PM like we do. The closest we’ll come to that is people like Bernie Sanders calling themselves a “Socialist Democrat”. It’s still part of the Dems but you know what flavor you’re getting. If the Independent candidate splits the Democrat vote the Republican will win. If he splits the Republican vote the Democrat will win. We’ve been down this road before. History is not taught in school. Of course. This is what the Dems fear about Schultz running as an independent. We don’t need a third Party. What we really need is two new Parties. And both of them need to be loyal to the Constitution. Or just one party.. THE CONSTITUTION PARTY! I think the only reason conservatives are in the GOP is because they are absolutely unwelcome in the Dem Party. That wasn’t true maybe 25 years ago. Conservatives seem barely tolerated in the GOP sometimes, especially considering their treatment by Boehner (a total total *ss, IMO) and McConnell. IMO that’s because the GOP has effectively become DEM_lite. HENCE WHY WE NEED TO LET Those rinos die off, and make a TRUE conservative party! You’re right Ituser, as much as it would be great for a libertarian to win. It always seems to backfire on the republican party and make the dems the winners. Instead of waiting for the rinos to die off, we need voters to educate themselves to know the difference between a real republican and rino. It’s too bad Americans spend too much time watching sports instead of learning who to vote for to make this country better. If you took a camera crew around this country and asked the public questions about politics, most of them don’t know squat, but they can give you all the specs for sports. Things like most yards rushed, how many completed passes, how many touchdowns. Or Baseball, how many runs, how many runs batted in. These things don’t make the country better. How many of them know who they’re congressman is for they’re district ? None of those specs will help you out when the country is run by a socialist and dictates all the new laws. The very thought of Ocasio-Cortez running this country is terrifying. We can’t get people to learn about politics, we need to be teaching them ourselves. Well, it doesn’t matter if the voters are educated or not, IF THERE ARE NO TRUE RED and blue conservatives actually running for them to research and vote for.. I think if there were a 3rd major party formed, it would be a split of the GOP. The Dems seem to be in lockstep. The Dem conservative became an extinct species about 15 years ago. It seems Dem moderate is also and extinct species. The GOP is the party with a diversity of thought. So if a 3rd major party were to form, it suspect it would be from a splintering of the GOP, and their respective supporters, not anyone from the Dems. I don’t know how much truth there is to it, but I’ve read that Trump’s IQ is between 155 and 160. I don’t know if he plays chess, but he certainly seems to be 8 to 10 moves ahead of the democratic party. I’ve always known that he could shutdown a lot of investigations, but he seems to get a kick out of seeing where they will go. It almost seems impossible at times but I think that if we give the democratic party enough rope they will eventually hang themselves. I know a lot of people are tired of waiting as am I. But you know as well as I do that the writing is on the wall. The more left wing they show the American people they are, the more people are moving to the Republican side. It’s just sad that the Republican party won’t support Trump. I’d love to send 2 ping pong balls to every Republican with a little note. It seems like the Republicans have no balls, so here I’m giving all of them two. 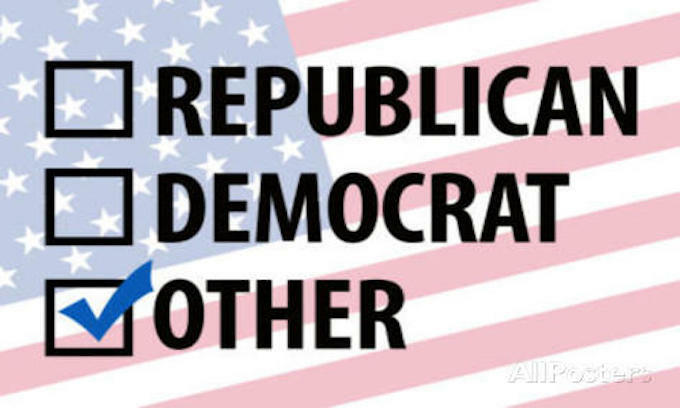 I do not understand how 50% of the American voters do not understand that the two parties we have, started out clean, and then Dems infiltrated the Republican party, hence the RINOs, and vice versa. Are they truly that dense to think another party would stay pure? If so, just like with AOC, they show the sad condition of our education system. I just shake me head at such stupidity in our nation. If we had always been this stupid, we would never have achieved what anything, which I guess shows what we will be achieving in the future. Pitiful! It wasn’t 50%. Just 50% of those (probably less than a thousand folks) they polled..
Marie, If that email address is your real email address, you might want to consider a fake address. It’s only a matter of time before libs will find this site and troll us. Would you want them knowing your email address? Forming and advancing a third party would be painful. But having lived in Michigan as an “ignored Republican” since Ronald Regan won and President Trump came along, it is probably time to suffer through the pain of creating a third party that is professional, knows how to run things like the huge company/business that is the US government, and has morality. The push toward infanticide by Democrats is as sick as the killing of babies by North Korea, China and Nazi Germany. Yet today Pelosi said banning full term baby killing would be a sad thing. I for one am beginning to Pray that President Trump consider starting that third party. He has kept his word across the board, something all other politicians and parties have failed for decades to do. Pray for America, we are in terrible trouble. One thing for sure, Kent, he wouldn’t be losing much if he went third party, in terms of party support. How much help/support has he received from the Establishment Republicans? They’ve done nothing but collude with the Commucrats to stab him in the back since he was elected! They did NOTHING to help with the majority we gave them in BOTH houses of Congress–except complain that they didn’t have a big enough majority, and used that as an excuse for making NO ATTEMPT to help with legislation they PROMISED to deliver to get elected! I’d vote for him no problem, if he went 3rd party! Vote for the most conservative candidate in the primary election; not neccessarily the incumbent. Then vote for the Republican to block the Socialist / Democrat. Assuming we even GET a true conservative running against the incumbent RINOS.. The GOP LOVES staging things, so we don’t GET that option. IMHO…there would be no need for more political parties if our elected leaders would just abide with their oath of office…especially the part that says”….defend the Constitution…”. Wouldn’t that be refreshing? A strict Constitutional government. Well, maybe if there were actual repercussions for NOT abiding by that oath, MORE WOULD! Isn’t breech of contract punishable ? Oh, wait I forgot the law doesn’t apply to anyone in DC. They all should bloody well be able to get sued for Breach of contract. Unless we get a candidate, and a house and senate that can agree on a balanced budget, upholding the original constitution, secure the border, teach people to be self sufficient, grow their own foods, work and pay their own way, and to love your neighbor as your self, and Love the Creator God, we are doomed for the last days wrath of God, and Jesus returning, culminating with an empty lifeless Earth..
Dream on .. Third parties have never been successful in the USA, nor will they be. The Democratic Party = An organized collective death wish for our nation. The Republican Party = In a fog. No real drive and innovation. Offers tradition as an alternative to death wish. Not a great option. Donald Trump needs genuinely good and innovative minds to back his vision. The Republican Party now lives in a assisted living political world. No guts to be seen with only rare exception. Seems like they all have been medicated. Where is the American that is true America? Political corruption seethes in both parties. your comments are well taken and the only thing that I can envision is that somehow term limits be enacted to prevent the what appears career politicos want to do is protect their “fiefdoms” forever. Unfortunately unless WE the people get to vote that law into being, i don’t EVER see them passing a bill limiting themselves.. THEY ARE too power mad to ever do that. We need an American Patriot Party or just a Patriot Party. During the State of the Union speech there were plenty of patriots shouting USA, USA. The Dem party has gone soviet. Two many in the Rep party are interested in their pocketbooks and not in serving the needs of conservatives. A Patriot Party would crush the Dems out of business and cripple the Rep party. Too many of the few people who vote are dazzled by slick campaign advertising and thus fail to search for candidates who truly stand for conservative principles; the only ones capable of restoring morality and decency to America. Vote for the right candidate and ignore the daily ads on TV, radio, and in your mailbox. Well, since the career politicians of the Establishment Republican AND Democrat parties have utterly failed to represent ANYBODY except their OWN self-interests, and whatever special interest lobbyists are bankrolling their campaigns, it is not surprising that people are turning their eyes toward third parties. The only surprise is it hasn’t happened sooner! Lot of people disgusted with the Left turn in the dem party. Others with the lack of guts by repubs to stand up for principle. Too many Senate rules block getting stuff done. The two major parties that exist today no longer represent The People, they only represent themselves. I support Donald Trump as President because I believe that he is working for the People who elected him and will support him in 2020 should he choose to run again. Trump made promises and is working hard to keep those promises, despite the barricades thrown up by both parties to impede his progress. If the Republicans and Democrats actually worked as hard for the United States as they work against each other, lining their own pockets, the wall on the Southern Border would already have been built and the immigration problem as well as many other problems facing our citizens (taxes, Medicare, Social Security, etc.) would have been handled. If there was a truly viable third party, I would most likely support that organization because I find McConnell despicable, Schumer absolutely abhorent and there are no words printable to describe my attitude toward Pelosi. I agree that there should be term limits (12 years max in either House and out) and a very limited “free ride” afterwards. A retired congressman/woman could work for a defense contractor after leaving but could not lobby the government at all. A third party is just wishful thinking on the part of those straddling the fence between doing what is right and being “in with the in-crowd.” It’s a manner of thinking in common with the developing teenage brain. I keep reminding democrats around here that it’s still a secret ballot. If you must, you may be in with the crowd with a nod and a chortle, but vote for what is right behind the voting booth curtain. Can’t blame people for wanting 3rd party. The so-called democrat party is really the Marxist party. If Harry S. Truman or JFK were to run today, they’d have to run as republican. Even FDR and LBJ would have a rough time getting through the primary process. Even though I don’t like Crazy Commie Bernie, He DID get screwed out of the nomination that was fixed for a wretched washed up ***** witch. And remember all the promises the republicans made in 2014 about stopping the wimpy powerhungry lying whosyourdaddy puke face toothpick Obama? After the republicans were giving control of congress, Bohner said we were dreaming if we really thought they were going to stop Obama. McConnell said he would NOT shut down the government to stop Obama. Republican voters got screwed. Thus brings in the Trump presidency. Term limits on representative and senators plus supreme court would be the best way of cleaning up the government. 3rd party sounds good now but in time they would end up just as bad as the other two parties. The Spineless GOP have not earned nor do they deserve my vote. They have in fact stabbed us in the back by squandering the first two years of Pres Trumps term when they CONTROLLED ALL THREE BRANCHES yet refused to fund the WALL! The question though is are there enough Conservatives in this country to win an election or would we be splitting the vote and handing a victory to the Commie Left ? Nonetheless, the GOP needs to and must be punished for what they did. Or they will take it as a signal to abuse their position even further and continue to take us for granted. Calilfornia adopted the suggestion offered above whereby the two highest vote getters have a runoff. This is destroying the Republicans in California, as Dems cheat and get all the votes, especially where contests are “close” and Dems find ways to “Keep finding provisional ballots to stack the outcome their way. The partisan bickering is what is destroying our country. At the SOTU speech the other night, it was clearly evident that all the junior congresswomen, dressed in white cared more about celebrating their own success in getting elected than celebrating all the wins and successes of our country. We need to make it easier to oust them (as voters) than having them constantly trying to oust each other, rather than work on the problems facing our nation. – Do we need a border wall? -Should we have a balanced budget? -Should politicians be able to vote themselves pay raises? If within a given period of time, our politicians fail to perform, we say its time for a new speaker of the house, or senate majority leader, as their failure to lead indicates that they are not doing what we elected them to do! That is why i feel, EVERY STATE should have a law, allowing the people to RECALL sitting senators or house of rep members. NOT having to wait 2 or 6 years.. I have been an independent for a long time, not the party, the mindset. There are more than two parties, but none of them have anyone worth voting for. I usually register with the party that has something to offer. That is almost always Republican, but there are many of those that are just as bad as most Democrats. I will always vote against a known globalist but the unknowns sneak in all the time. Does anybody else get tired of dems who became multi millionaires as a life time congress person or senator, talk so much about how unfair it is to not take more money from those that worked hard to make their millions? Time to kick the box out from under these under performing elites. None of these ever win. Instead, they produce a splintered result that undercuts a clear-cut “winner” that has a mandate to effectively govern. Truth be told, there are times that the Republican is somewhat less than appealing but the Democrat is even worse. This means I must vote for the Republican in an effort to deny the office to the Democrat. This also highlights the need that we Republicans must carefully choose the very best Republicans in the primary election; even if this requires booting out the incumbent. A third party would certainly guarantee that nothing but Democrats will ever get elected from then forward! Why you ask? The only way a third party would survive is if we went to a parliamentary form of government.